Impact Wrestling presented their go-home show before Slammiversary tonight. 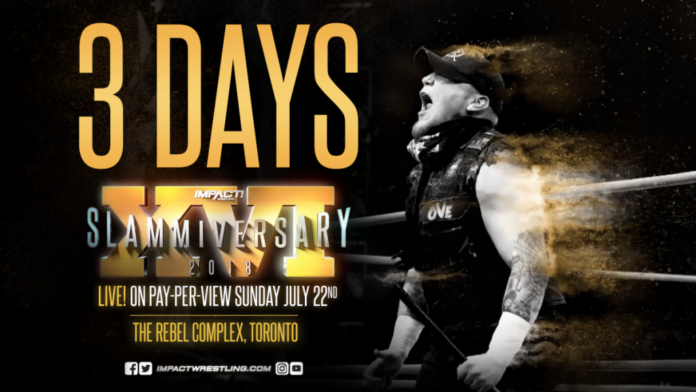 We are now just 3 days away from Slammiversary and one of the biggest nights in the promotion’s recent history. Here are 9 takeaways from this week’s episode of Impact Wrestling. Kross ran through Petey Wiliams to open the show. He even toyed with his opponent during the match, releasing his Kross Jacket submission even though Williams was clearly unconscious.
.@realKILLERkross just walked into @iPeteyWilliams' hometown and choked out Petey mercilessly with the Kross Jacket. Killer Kross isn’t booked for Slammiversary but seems poised to do big things in the following two days of television tapings. Real name, Kevin Kross, he was the 2018 recipient of Cauliflower Alley Club’s “Rising Star Award”. It was also his 33rd birthday today. Callihan demonstrated to Pentagon Jr. what his plans are for him on Sunday. After making short work of Greg Osbourne, he informed everyone that Impact management asked him to promote the pay-per-view. He attempted to do this but was interrupted by Pentagon Jr.
Pentagon’s sub-titled promo riled up Sami and the members of oVe. They ran to the back to find him. The Crist brothers got separated from Callihan and thought they discovered Pentagon. They ran up to attack who they thought was Pentagon but it turned out to be Callihan in Pentagon’s mask and tied to a chair. As they were figuring this out, however, Pentagon entered the scene and took out both Crist brothers. This left Pentagon with Callihan. The only thing left for Pentagon at that point was to inform Callihan that he is Pentagon Jr and he has no fear. The Great Gama Singh has been running the Desi Hit Squad through old-school conditioning drills and tonight they used old-school tactics to get the victory. Old-school dirty tactics mind you, but still. Tonight, the Desi Hit Squad were victorious over KM and Fallah Bah. With the Great Gama distracting the referee, Gursinder Singh raked Bah’s eyes and Rohit Raju rolled him up with his feet leveraged on the ropes for the pin. Previously, the Hit Squad defeated the former champions, Z&E as well. They aren’t booked for Slammiversary but their two wins from the Windsor tapings should put them in a position to face top teams at the tapings to be held the following two nights. “This is a ‘what have you done for me lately?’ business,” stated Don Callis today in reference to Eli Drake. He also said the former Impact World Champion has to prove himself all over again. Callis continued to mention Drake recently re-signed with the company. After defeating Grado last week, Drake dropped his match tonight to a debuting Joe Hendry. Eli Drake isn’t booked for Slammiversary but will likely be back in the mix of things over the next two nights of TV tapings. The match between Andrew Everett and Dezmond Xavier was interrupted by a deranged Eddie Edwards. He took a Singapore cane to the referee and then addressed Tommy Dreamer on the microphone. Edwards predicted pain and violence for his match with Dreamer at Slammiversary. He continued to make various promises related to how much he would make Dreamer bleed on Sunday. Finally, Edwards promised he would prove to Tommy Dreamer that he is the real “Innovator of Violence”. Su Yung has been haunting Madison Rayne in her dreams. Last week, the Undead Bride lured Rayne into a field where she was surrounded by her army of zombie bridesmaids. They all really wanted to inform Madison that her time has come. This week, Rayne’s dreams were haunted by visions of Su Yung and her minions as well as seeing her own image in a coffin. When she awoke she was back in the same field as last week. That’s when Yung gave her the Brood’s “Blood Bath” treatment.
.@Tess_Blanchard isn't exactly known as a team player. Blanchard didn’t seem to have much interest in softening her opponent up for Slammiversary. That’s clearly the only match coming up which matters to Blanchard as she just bailed on this one tonight. For the second week in a row, Allie pinned Shotzi. Allie will be in tough against Blanchard on Sunday, however. Somebody needs to check on @CyrusOverHuge after that @Lady_Scarlett13 reveal. The soon-to-debut Knockout was given a name this week. She is Scarlett Bordeaux, a Chicago-based wrestler who has wrestled for ROH, got squashed by Nia Jax on WWE TV, and somehow won the comedic DDT promotion’s Superheavymetalweight championship at one point. When she was in ROH she was mainly used as a valet for Matt Taven but wrestled a few matches there as well. Josh Matthews stated that Bordeaux will be on the show next week. 1Austin Aries’ Normal Tricks Not Enough To Beat Moose? Aries used the same tactics he used to beat Pentagon and the same he used last week on DeAngelo Williams. Only this week, they didn’t quite have the same impact. After tricking Moose into thinking he wasn’t coming into the ring, Aries snuck up from behind and booted the title-challenger low. He then gave him a devastating chair shot and picked up the microphone assuming his opponent was down for awhile. Only Moose got up much faster than Aries expected. Aries had been confident in the weeks leading up to this match but all of a sudden with just 3 days to go his demeanor appears to have changed considerably.